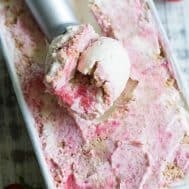 This Strawberry Cheesecake Paleo + Vegan Ice Cream is a cashew-based, creamy “cheesecake” ice cream with swirls of strawberry puree and a grain-free graham cracker crust! It’s the perfect special treat for summer that no one will guess is actually gluten-free, dairy free, paleo and vegan! It’s no secret that I have a major crush on all things cheesecake. I actually remember the first time I tried REAL cheesecake as a child. It was NY style cherry cheesecake and it was amazing – seriously – it changed my life. It changed my life in the sense that I realized that there are no limits when it comes to how delicious food can really be. And yes, I had those exact thoughts upon my first bite of that cherry cheesecake at age 5. Okay, that might be an exaggeration. However, cheesecake remains one of my most beloved desserts, and really – you CAN make dairy-free “cheesecake” that tastes pretty close to the original masterpiece. Back to the no-limits thing now – because obviously this recipe is all about busting through limits to create something incredible. 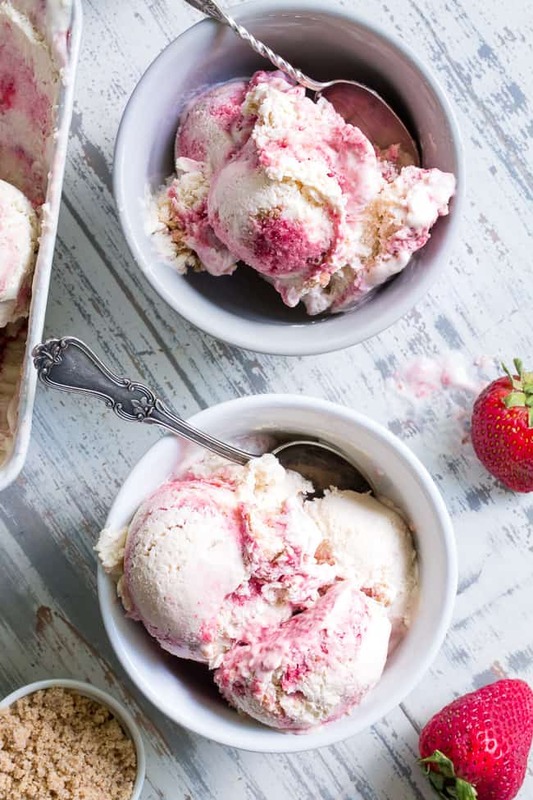 An ice cream that tastes like strawberry cheesecake that’s actually dairy free, gluten-free, vegan, and paleo. Say what?! How is that even possible? 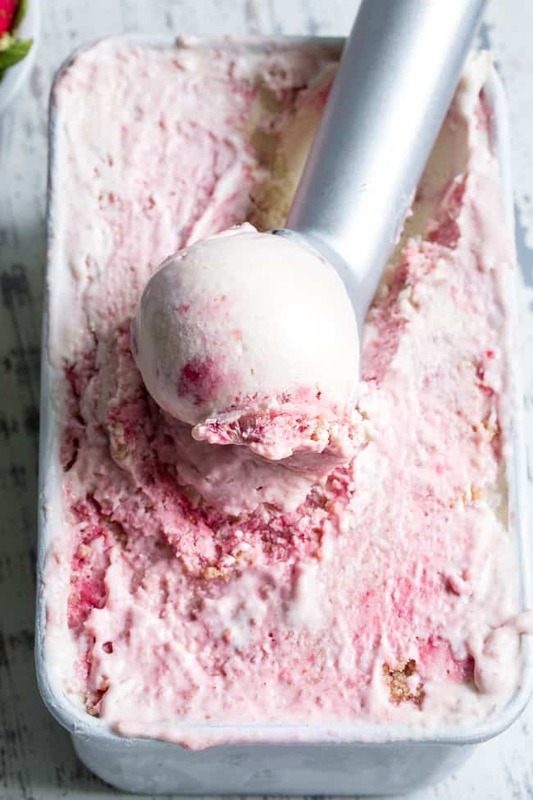 To be honest I had my own doubts as well, but really – this homemade strawberry cheesecake ice cream is flipping delicious, and totally DOES taste like both strawberry cheesecake and ice cream. First, I started with the ice cream base. It ‘s a combination of cashews and coconut milk for creamy texture, maple syrup to sweeten, and lemon juice and vanilla for that signature cheesecake flavor. So much respect for cashews, by the way, because they once again created a dessert that has completely rocked my world. Just a side note, now back to the ice cream! 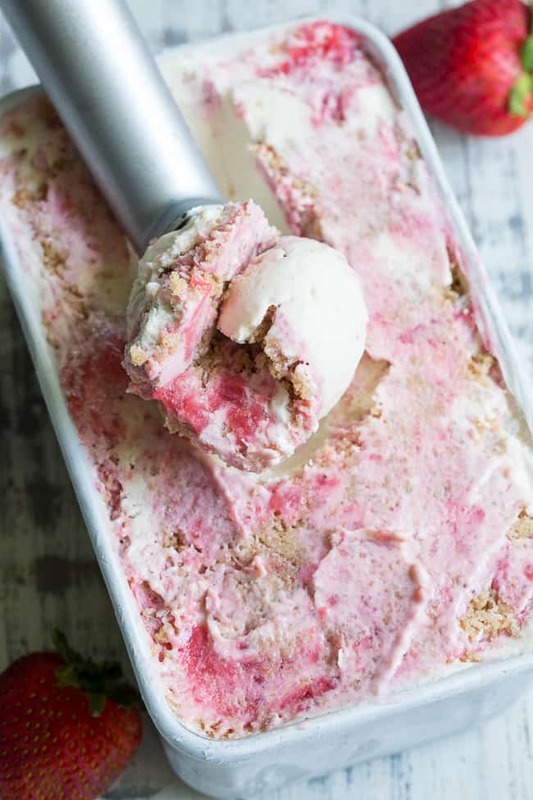 To infuse the ice cream with that strawberry cheesecake flavor, I created both a swirl of strawberry puree and a layer/swirl of a copycat-graham cracker crust. Both the strawberry layer and the crust layer are super easy to prep – the strawberry layer does need to be cooked very briefly to thicken though, but you can make this ahead of time to cut down on steps. 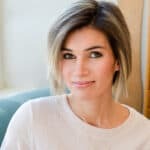 The ice cream does need to be churned for extra creaminess – I used this ice cream maker and it works perfectly for me every time for all my paleo and vegan ice cream! I recommend storing the bowl of the ice cream maker in the freezer for a couple of days prior to using – it helps the ice cream churn and thicken quickly! Mine took 20 minutes to get to a soft-serve texture. Once your ice cream is churned, it’s time for the fun part – putting everything together! 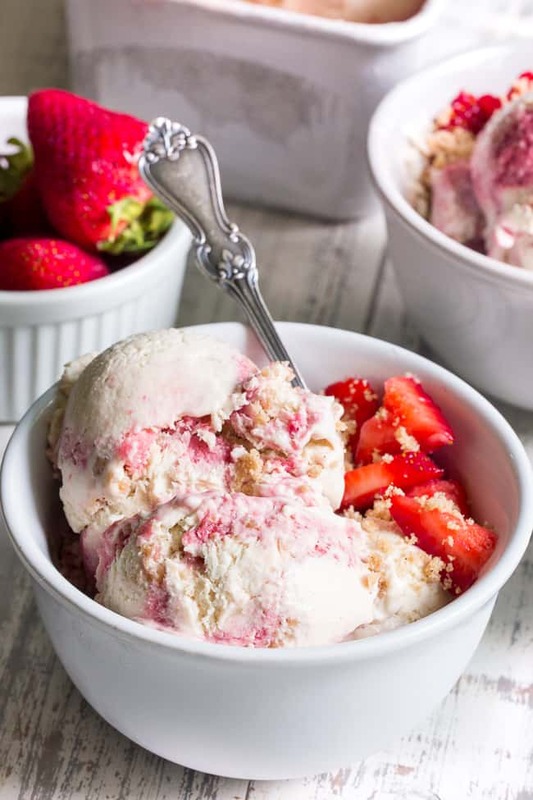 I layered the ice cream, strawberry sauce and crumble in three parts – gently swirling in the toppings before beginning the next layer. Once you’ve used up all your ice cream and toppings, smooth the top and cover tightly with plastic wrap. I’ve learned that it’s important to make sure the plastic wrap is in full contact with the surface of the ice cream to reduce icing after it freezes. 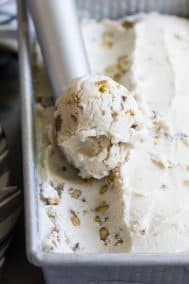 Like most homemade ice cream, after being left in the freezer overnight or for an extended time, it will become too hard to scoop straight out of the freezer. Make sure you plan ahead and place the ice cream in the fridge for about an hour before serving, or on the countertop for 20 minutes or so. I hope you’re ready for an unbelievably tasty dairy-free frozen treat – let’s go! 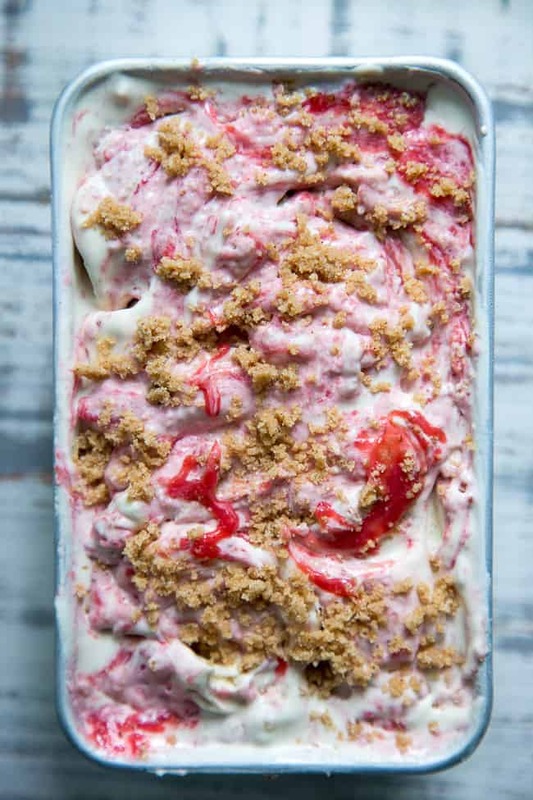 This Strawberry Cheesecake Paleo + Vegan Ice Cream begins with a cashew-based, creamy "cheesecake" ice cream and swirls in strawberry puree and a grain-free graham cracker crust! It's the perfect special treat for summer that no one will guess is actually gluten-free, dairy free, paleo and vegan! Place ingredients in a blender or food processor and blend on high until mostly smooth. Place blended mixture in a small saucepan and heat over medium heat, stirring, until bubbly and thick. Remove from heat and chill until ready to use. Blend all ice cream ingredients in a high speed blender (I used a Vitamix) until very smooth. Place blended mixture in the freezer to chill for 5-10 mins. 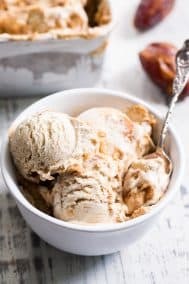 Set up your ice cream maker and pour all the ice cream base into the bowl - churn for 20-25 mins or until ice cream is very thick and creamy. Transfer 1/3 of the ice cream into the bottom of a small loaf pan, then layer with 1/3 strawberry preserves and 1/3 crumble mixture. 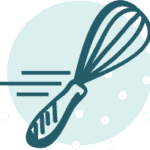 Gently swirl with a knife or toothpick, then repeat twice more until all ingredients are used up. Cover the top of the ice cream with plastic wrap, pressing down to remove air pockets. Freeze 2-4 hours or overnight. Before serving, allow ice cream to sit at room temp or in the refrigerator to soften. Enjoy! *Make sure the bowl for your ice cream maker has been chilling in the freezer for at least 24-48 hours prior to churning. 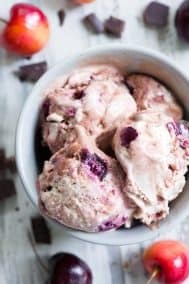 Want More Paleo + Vegan Ice Cream Recipes? Try One of These! Love how creamy cashews are!! 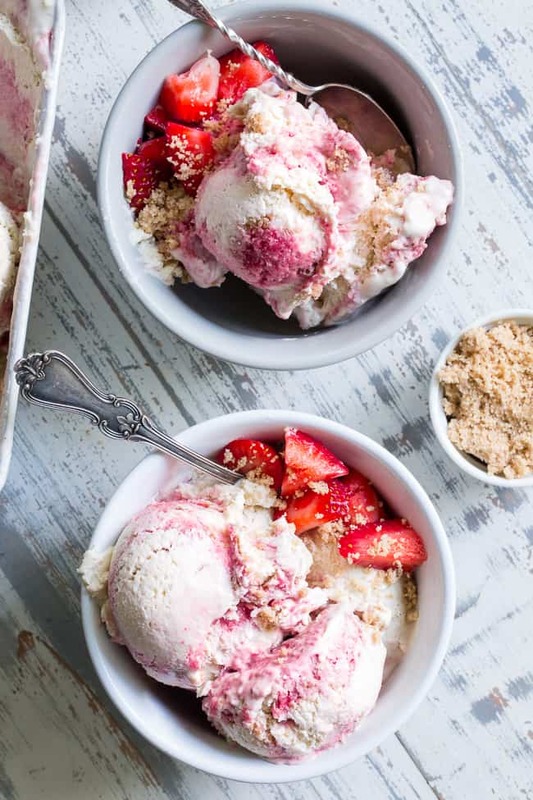 Do you think you could make this without an ice cream maker? I think it would be difficult since churning it really makes it nice and creamy prior to freezing. Awesome! Thrilled you liked it! This was my first ice cream recipe I have ever tried – and let me tell you – it is on POINT! Soooo good! My whole family loved it. Thanks for a yummy recipe that is sure to be made again and again! Wow, Very delicious recipe, and want to eat after going to home, Thank you so much for share this recipe…..
could I use 1/2 cup date paste instead of the maple syrup? trying to stay as low sugar as possible. Your recipes are amazing! I have tried several coconut milk ice creams but they just never tasted very good, but I made your salted caramel one and it was delicious. Everything I wanted it to be! Also, your recipes are the only ones my husband eats without asking if it’s one of my “weird” recipes. You’re famous are all made of dishes. 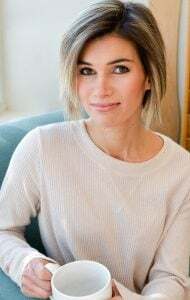 I am always waiting for the eagerness of your new recipes. I think that would work well, let me know what happens! what did you mean by water? Made this tonight. It was fabulous. My husband has not been able to have any dairy in over 4 years and he kept saying it tasted like cream cheese. Will be making this again. Thank you. I just made your chocolate no churn last night and it’s soo good!! This is going to be my next batch!! I do have a few questions. Can I use the tapioca starch in place of the arrowroot? Just wondering since I just bought the tapioca. And as far as soaking the cashews, what do I use to soak them with and how much? Thanks so much!! I’m so happy that I’ve come across your blog and I LOVE watching your insta stories!! It was amazing! Perfect end to our Labor Day weekend. Can u use swerve instead of maple syrup in all the 3 parts how much swerve should I use to replace the maple syrup ? Diabetics would really appreciate this Thank you ! Could I substitute Walnut milk for all or some of the coconut milk cream (what is milk cream anyway….just milk or just cream?) I’m trying to watch calories and a cup of coconut milk – not cream – can be 540 calories depending on the brand. One cup of walnut milk original is 45 calories. If you haven’t tried it, it is delicious. Great for hot cocoa.